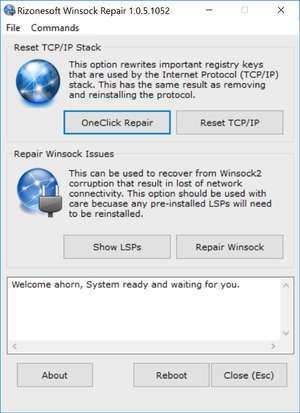 Winsock Repair is a small, though discontinued tool that can help resolve networking issues on Windows systems by repairing and/or resetting the Windows socks. The main interface of this application is very easy-to-understand, containing only a few buttons to get the task completed. The "Reset TCP/IP Stack" section will rewrite the Windows registry to reset the values to defaults. You can do this by "OneClick Repair" or "Reset TCP/IP". Version 1.0.5.1052 is a freeware program which does not have restrictions and it's free so it doesn't cost anything. For security reasons, you should also check out the Winsock Repair download at LO4D.com which includes virus and malware tests. Additional screenshots of this application download may be available, too.